Vita is delighted to be a major sponsor for the International Meeting of Young Beekeepers that is coming to Britain in just over one month’s time. 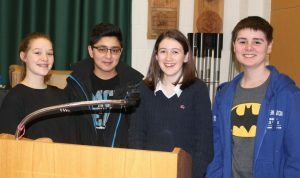 More than 20 teams of young beekeepers aged 12 to 16 will descend on the beautiful and historic Wiltshire town of Marlborough to test their beekeeping skills and knowledge. Working in mixed nationality teams of six, communication will be the key as they take on challenges like … well, actually we don’t even know because it’s all being kept top secret to surprise the entrants. Vita’s Blogger has been called into action to see if he can find a Drone Congregation Area in the vicinity so that the youngsters can take a break in competition to go for a hike one afternoon. Set in the prehistoric landscape of Avebury and Stonehenge, visitors are in for a treat – with visits to those sites and Bath too. For space reasons the event is private, but Bee Craft’s Richard Rickitt will be there to video some of the action and post it on You Tube. We’ll keep you informed. Vita’s new protein supplement has been tested in extensive field trials and found to increase honey production by up to 18% (2.54 kilograms more honey per colony fed with VitaFeed Nutri compared with control colonies fed only with sugar syrup). 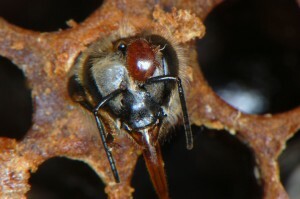 The importance of controlling varroa populations especially in areas of relatively dense bee colonies was stressed by Dr Dennis vanEngelsdorp at the BBKA Spring Convention earlier this month. A sick colony explodes into the landscape and infiltrates su rrounding apiaries, he said. He identified the three key risk factors to bee health as varroa mites and associated viruses; pesticides in the field and in the hive; and poor nutrition. Of these varroa is the biggest threat – and he and a research student soon expect to publish a paper showing that varroa mites feed off the fat rather than the haemolymph of honeybees – a factor that is of considerable importance for bees going into winter. In a sample survey, he found that 56% of beekeepers had not used varroa-control products in the previous twelve months. For some hobbyists, not treating for varroa and losing, say, nine of ten colonies doesn’t matter too much. However, the impact does not stop at their own apiary. In another study, he and his team marked bees in an apiary either yellow or blue. Yellow indicated that the colony was collapsing, blue that the colony was healthy. The collapsing colonies duly died out, but their surviving yellow-marked bees exploded like a bomb in the landscape. Those yellow bees were found in almost every apiary in a two-to-three-kilometre radius! The implications are clear. 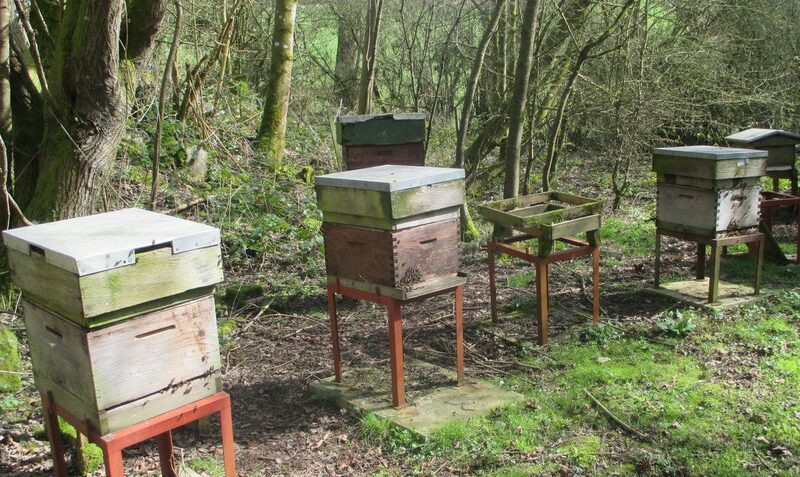 You are treating for varroa not just to keep your own bees healthy, but also those of your neighbours in the surrounding landscape. Saturday’s fine weather gave the opportunity to open up my colonies for the first time this season. All but one of the nine colonies came though winter well (and two are about to be given away). Can you tell which colony was queenless? It’s the one on the left. On inspection its bees were behaving quite normally. 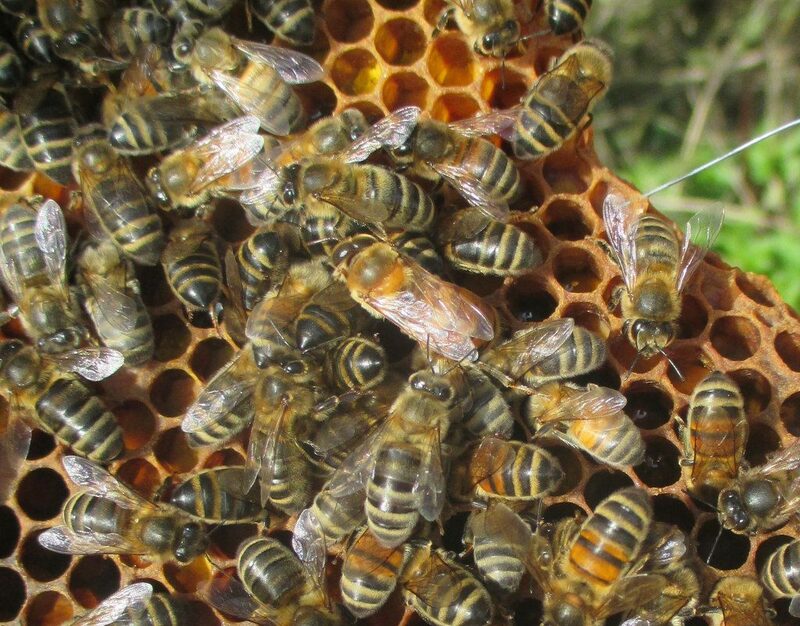 They were strong in numbers, bringing in pollen, calm on the comb, but there wasn’t any sign of eggs, larvae or sealed brood – not even a drone-laying worker. Most odd! I suspect the queen finally ran out of steam just one month ago. On closing up the hive, they weren’t quite as interested in what had just happened as the bees of the queen-right colonies. I knew it was going to happen one day – and that day came last night after more than twenty years. I knew I’d have a honey spill carrying buckets between the warming cabinet and bottling in the kitchen. But at least I had the foresight to move the honey-warming cabinet downstairs. And at least I took care to make sure the lids were on each plastic bucket before moving it. I even knew to take care using these new-fangled all-plastic buckets (my older and better ones are sturdier and have metal handles). But it happened anyway – the plastic handle broke and on hitting the ground the lid broke – more than 7 kg of warm liquid honey surged over the kitchen floor. At fifteen minutes to midnight, the silent assassin had struck. It was all so quietly done. Well, apart from my single-syllable, anglo-saxon outbursts. The good news is that I had reached the kitchen having successfully carried the honey over the hall carpet. There was more quite unexpected good news: the kitchen floor is very slightly concave. And the honey was quite viscous. But there the good news ended for the next hour. I discovered new things: honey is not just sticky, it’s slippy, very slippy! Taking off my socks to wade through the warm goo, I almost ended up where I least wanted. 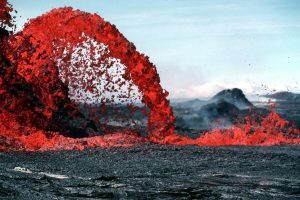 Rushing to get towels to soak up the slowly spreading lava flow, I had to try to clean my feet – and of course the flow was strategically placed between me and the sink. I have no photos of my joy. Even in the age of the selfie, I had another priority. Thank goodness for the slightly concave floor. This morning, apart from unexpected stickiness in unusual places and a faintly sinister gleam off the floor, I think all is well and there is no need to let bees loose to clean up the mess.